Quite the most depressing news – but absolutely what one would expect. The Conservative Government in Ottawa wants to give its supporters everything they want. They also want to avoid an election – as does the Opposition. So instead on conducting the review of the Environmental Assessment Act which was due to start in May, they have just tacked a bunch of provisions onto the budget. That way the Liberals can’t vote against it without bringing down the government. And it would seem that the Liberals will probably let them get away with it. Not that the EA Act has been especially wonderful – after all, we still got the tar sands development. But it was the remnant of a time when Canadians seemed to care about things like forests and lakes, rivers and wildlife. And about being able to have clean water to drink and fresh air to breathe. Apparently those things are not nearly as important as making money and avoiding elections. And no, the publish date is not April 1, it’s March 31, so it’s not a prank. This is serious. As you would expect, after doing a piece on Monday on the James Lovelock interview I have been getting comments from the deniers – none of which have appeared. Becuase I simply do not wish to give them any platform at all. Sorry, I have no obligation to provide “balance” – the so called “debate” is way too overly anxious to publish things that support the fossil fuel industry. I will however provide what seems to me to one of the clearest rebuttals of the claims of the “climategate” crowd – which has been published by the Associated Press and is in The Seattle Times this morning. The House of Commons’ Science and Technology Committee said Wednesday that it had seen no evidence to support charges that the University of East Anglia’s Climatic Research Unit (CRU) or its director, Phil Jones, had tampered with data or perverted the peer review process to exaggerate the threat of global warming — two of the most serious criticisms levied against the climatologist and his colleagues. That seems to me to settle the issue. It won’t of course. Any more than the bricks through the windows of Democrat Senators who voted for health care reform settle that argument either. Indeed, the parallels between the way the two sides argued in that discourse are disturbingly similar to the climate “controversy”. In both cases it is as clear as can be that the right wing is wrong and facts are against them. But that does not stop them. And it is not that the people who promote the cause of the insurance companies, or the fossil fuel companies, are stupid. They are simply doing what they are paid to do. In the case of US health care they were not unsuccessful – there is still no public option let alone the single payer that most other countries have. In the case of effective action against greenhouse gas emissions, they have also been remarkably dominant. The results are now going to be dire, because we really are heading for an unprecedented increase in global temperatures – well in our experience anyway. The same sort of people who deny climate change also like to deny the scientific evidence for the age of the planet (and the universe come to that) – and many of them believe that the end of human life on earth is all pre-destined and that they are the only ones due to be saved. Of course belief and science are two different things. You cannot actually argue with thermodynamics. But then acts of faith do not require evidence either. Just a good story. Which is apparently why they get so much media attention. There is a risk, in writing this piece, that I am going to restart the debate which raged in my absence in February. I am a bit less than thrilled that the criterion can be expressed in such language. The problem is dramatically illustrated in the original by a photo of a Lagos slum. This is more than an unpleasant environment. Though some see slums as comparable to a natural process of adaptation – and centers of entrepreneurial activity and social stability. The big driver of urban reforms, historically, in places like London was concern for human health. People like Sir Christopher Wren wanted to rebuild London to look more impressive, but lost out to the much more powerful voice of the merchants and businesses that had to rebuild after the Great Fire, and do that quickly, to get a positive cash flow going again. About the only concession made to public safety was to allow a ban on thatched roofs. It was not until a ground breaking statistical study showed the link between cholera and water supply that the professions of urban planning – and public health – really got to be effective. And some of their ideas were a bit misdirected, or have become anachronistic, but we are still stuck with them. Like separation of land uses, or low density for residential areas. I have often thought that English “Town and Country Planners” were mostly frustrated architects – concerned more about issues such as “sensitive infill” and colour of paviours – than the social engineers they are accused of being. They mostly built places that were supposed to look good but didn’t work very well – like most of the post war New Towns. Most of which were pretty hideous too. It may be significant that I had to copy that out of the LRSP – the original seems not to be available on line. I think that most would concede that the objective I have highlighted has not been achieved. Nor is it likely to, as long as we pursue policies designed to maximize short term commercial profitability over nearly every other consideration. Much of what is built here is designed for a short life. 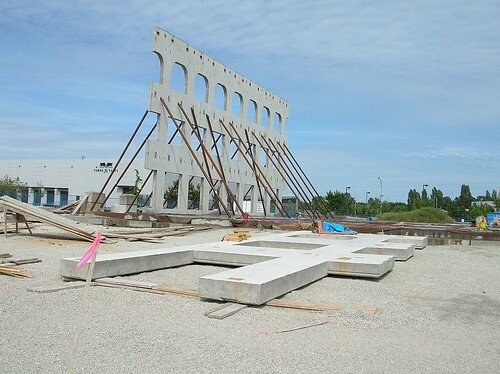 Most industrial and commercial buildings are little more than huge sheds – often built of “tilt up” concrete panels. 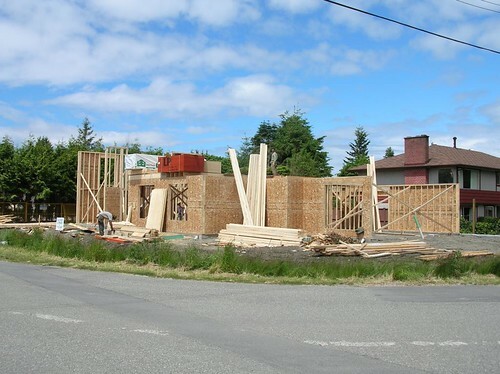 Most houses are still stick built – and many get pulled down and replaced within 40 years of being constructed. 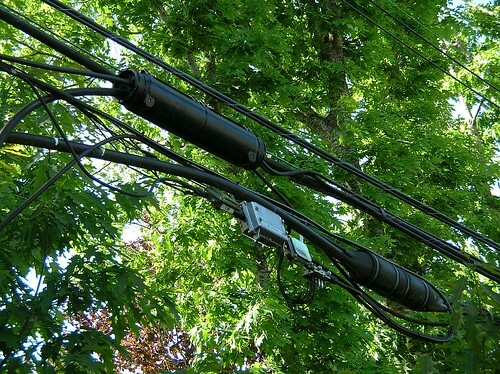 For me, one of the worst visual features is the wirescape: it seems nearly every view of our natural setting is through a tangle of hydro wires and tv cables. Because, of course, it is cheaper to string wire than bury it. And, someone once informed me, the Hydro crews get paid a lot of overtime to put the wires back up again after every storm – so organized labour is as keen on this method as their management. Worth the read, but I am not sure I am convinced. Firstly it is not democracy itself that is at fault, but the way in which we have allowed democratic processes to be subverted by corporations. As well documented (for instance by Jim Hoggan) the scientists have been portrayed as being part of a two sided debate when in fact there is a widespread consensus. Not one research paper appeared in a peer reviewed journal that showed that either climate change is not happening or is not largely due to human activity. But the companies that drill for oil, and mine for coal, and those that make lots of money from our fossil fuel dependency, are all funding lots of activity to sow confusion and dissent. Like the health insurance industry did – and largely succeeded – over US health care reform, where the objective facts can hardly be disputed, yet at least half the American public was convinced that they were somehow threatened by fairer health care funding. Indeed when one looks at the most prominent recent environmental stories – farmed salmon or “run of the river” hydro or fracking for gas – the facts speak for themselves but the corporations keep on winning, and every species, including us, pays dearly. I suppose it can be argued that we voted for the governments that make these bad decisions – and we keep on voting for them. But I would suggest that is due to the lack of democracy – we only get to make a choice between two alternatives (bad and worse) at infrequent intervals, and when we do, those who have the most to spend tend to win most often. But what bothered me most was that he did not read the emails in question but still thinks that data was somehow “fudged”. Which is not my understanding of what happened. There were two data series – actual temperature measurements for recent years and tree rings (and other things) for earlier periods before measurements started – and these were merged. Unfortunately one scientist referred to this as “a trick” – and those two words, wrenched out of context, were used as the “smoking gun” evidence of intent to deceive. 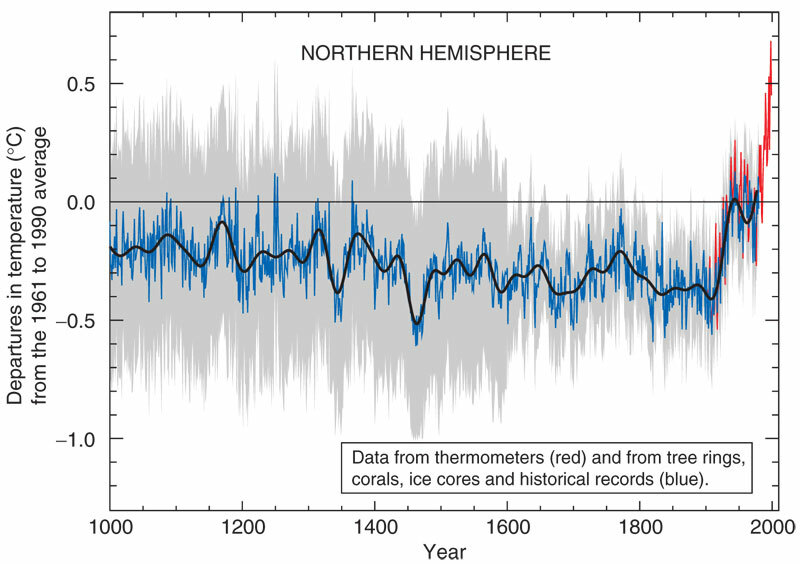 But what the famous “hockey stick” graph shows is anything but deceptive. Are we stupid? Or is somebody lying to us? I think the latter – and the people who are doing the lying are not the scientists but the corporate shills. Harold Steves, a longtime Richmond councillor and former NDP MLA, was in Delta this week to sound the alarm bells over the loss of farmland to various development projects. He says Delta could end up looking like Richmond in 20 years. Harold is, of course, the last farmer in West Richmond – and a local councillor. He was also one of the founders of the Agricultural Land Reserve, created in the wake of the wave of development that was allowed to sweep away all the farms in that area. The consensus in the region was that Richmond was not a suitable place for development, being low lying, and thus susceptible to flooding, but also very high quality and productive farm land. But developers and land owners did not agree, and there was at that time no effective measure to prevent a council determined to allow a lot of very profitable land use change to take place. The provincial government loves to boast of how green it is – and welcomes every photo op with a hybrid bus, or a run of the river power developer. But its actions are wholly the opposite. While the ALR is still on the books, the Commission which was set up to ensure the policies were effective has been gutted. 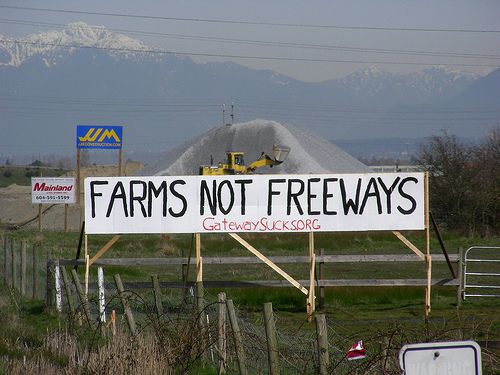 The deal with the Tsawassen First Nation, and the Gateway program to build the South Fraser Perimeter Road both require large amounts of the best farmland in Delta – and so they are being loaded with sand right now. The railway sidings at Deltaport are also being expanded. The port, of course is actually reporting declining traffic but no matter. Any more than anyone is paying attention to the failure of the US to pull itself out of recession – or the huge number of container ships idled and laid up around the world. The conversion of agricultural land to development is one of the easiest ways to make money quickly. Sale of the top soil – for which there seems to be plenty of demand – provides a quick positive cash flow. And the change in land use designation – a mere stroke of the pen – has a dramatic effect on land value. 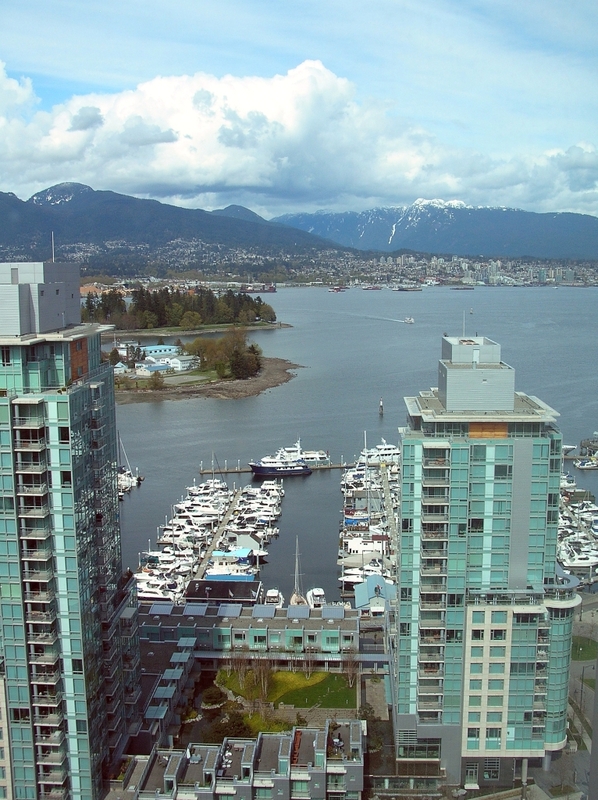 There is quite a lot of land around that needs to be redeveloped – most of the Fraser River frontage on the North Arm in Vancouver, for instance. Lots of former sites previously used as gas stations. Such “brownfield” developments are problematic and quite expensive. So despite the strategy of building a compact urban region – which is by far the most economical from nearly every other perspective – gets trampled by the greed of the developers. “Me first and the gimme gimmes”. All of whom support the BC Liberal Party generously and are paid back handsomely. We pay for the roads and other utilities that make the developments work, and we also pay in our Medical Services Premiums as heart disease, obesity and diabetes continue to take their toll on a sedentary, single occupant vehicle population. As well as the casualties from vehicle collisions on the roads, of course. There are lots of reasons to oppose the development of Delta – and many local residents are vocal in their opposition. Not that the BC Liberals are listening, which is why they lost the seat in Delta South, admittedly by a very tight margin. But the argument cannot be won by logic or reason when money shouts so loudly, and politicians say one thing and do the opposite. But once the crunch hits – and food costs in BC start to spiral – it will be too late. Because this land will not be brought back into food production – any more than West Richmond will be. It is the one way entropy of development akin to the burning of the rain forest. The economy is the subsidiary of the environment, not the other way round. And our primary needs are clean air, clean water and food. They all come from natural resources – and the worse job that we do looking after them, the more it costs to clean up the consequences. And those costs are not borne by developers. They are “externalities” which we all pay. And which this government is determined will be ignored for now. So we pay later. The Link Light Rail system in Seattle opened last year. Currently it is in service between Westlake and SeaTac Airport. Barbara Luecke gave a talk this evening at Richmond City Hall, the first of this year’s Lulu Series on art in the city. I am going to depart from my usual technique. Although I made notes as she spoke, it would be a great deal of work to make them coherent, and in any event all of the images she used are available on line. I think that it only makes sense to talk about the issues – not the art itself, which has to be seen to be appreciated. 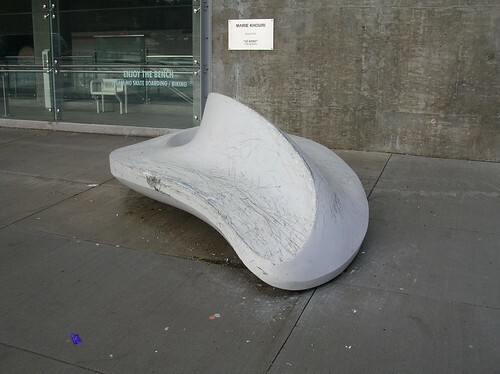 Sound Transit allocates 1% of its project construction costs to art. This art program covers all of its system – bus, commuter rail and light rail. Art is considered to be an integral part of each project and the program is involved from the very earliest stages. 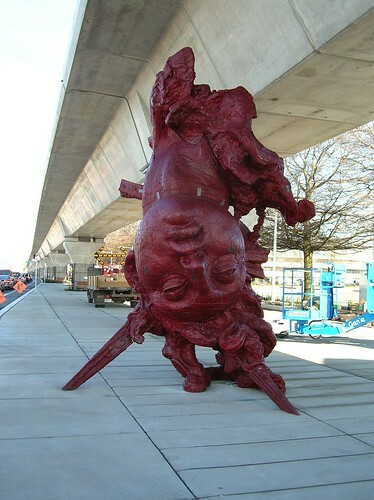 The talk this evening was solely directed at the art works on the new light rail line. The images she used are all part of a set on her flickr stream and some of the projects are linked from the Sound Transit website – scroll down to the heading Link Seattle – SeaTac Airport and there is a list of projects, but note that not all are as yet on line there. One point she did make is that the construction of the light rail line has been much slower than our Canada Line construction, with a great deal of commitment to community consultation throughout. This has lead to significant public conversations, about every aspect of the project including its art. Some installations are more controversial than others, but every one now has its own band of supporters. Art is also being installed as part of the construction process – for example a major but temporary light show at Capitol Hill Station. In shops that have been vacated prior to demolition to make way for station construction, art was installed into the buildings to keep the street interesting. The videos of these installations are well worth your time. My criticism of the Canada Line was that it all looks very bland. The comparison in my mind was with the much more individualistic Millennium Line stations – many of which were of striking architectural design and also incorporated public art. Some of the art at Canada Line stations seems to me to be a bit of an afterthought. Others are simply temporary – part of the current Biennale which will be taken away when that event is over. The argument is about the quality of the public realm. I think one feature that is probably worth remarking on is how the use of these art pieces has greatly reduced the graffiti and vandalism that had been blighting these areas before the LRT was started. Art is supposed to stimulate, and so of course there are a wide variety of opinions. If the only criterion was public acceptability, the result would also be bland and tasteless. But it seems to me that one way to upset people is to simply plonk down a set of standard components, regardless of the neighbourhood, all designed to some corporate image. That was the mistake made by the first Expo line – and has been repeated by the Canada Line. Both speak to a “culture” that simply looks at the bottom line and seeks to stay on time and on budget. Those are considerations, of course, but they are not the only ones. Transit has to be part of the city – and a part that we feel belongs to us. Indeed, the best transit systems inspire affection – not alienation. Which do you think we have achieved? 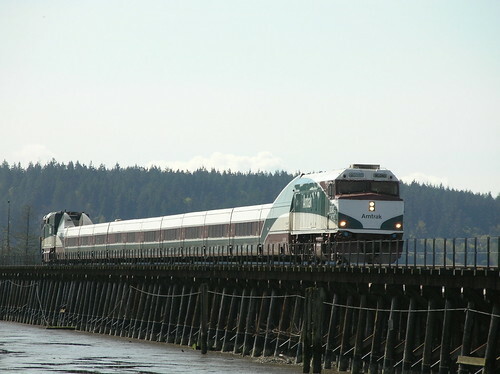 The second daily Amtrak Cascades train began service on Aug. 19, 2009 as a pilot project, running through the end of the 2010 Olympic and Paralympic Winter Games. The Canada Border Services Agency has since agreed to extend the provision of border clearance services for the second Amtrak train through the end of September 2010. So it has been kept going for the summer. At this stage that is not very much progress for an issue that has been going on for far too long already. The problem is that Canada is way behind the rest of the world. Our passenger trains are all dreadfully slow and old fashioned. The rest of the world is investing in High Speed Trains, which for city pairs like Vancouver – Seattle are much better and more efficient than flying or driving. Indeed, this corridor is one that the Obama administration has identified in its HST program. And that has real money attached to it. The problem is that Canada has no such program. Nor is there anyone, apparently, who can influence the Canadian BSA to behave appropriately. If a bus or plane operator decided to increase their cross border service frequency, there would be no problem at all. Its only because trains are treated differently that there is any issue at all. And the sum involved, while significant enough to deter Amtrak from operating a second train across the line (prior to August 19 last year it turned around in Bellingham), it is trivial compared to the benefits of getting people out of cars and planes. There actually is not much the province or the state of Washington can do. What should be happening is that our MPs – especially the Conservative ones – should be lobbying hard to get the BSA some money from somewhere. So far as I can see that isn’t happening either – or it has and has been totally inadequate.